Your body relies on a complex chemical system to perform at an optimal level, and eating sufficient vitamins and minerals can keep this chemical system in balance. 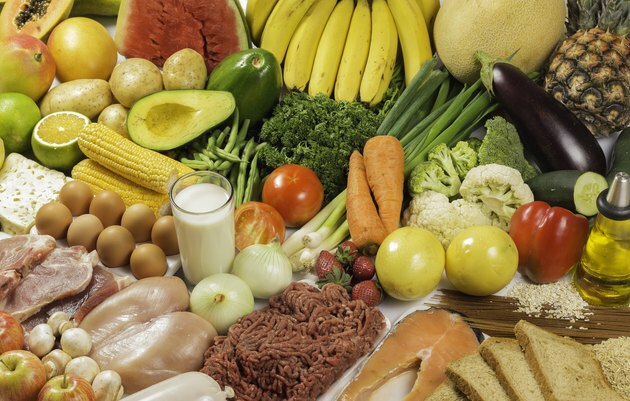 Tics and muscle twitches or spasms can be symptoms of insufficient intake of certain vitamins. For most people, eating a healthy diet will prevent deficiencies from occurring, but if you do develop a deficiency, supplementation can be a useful remedy. Always check with your doctor or dietitian before starting vitamin supplementation, especially of individual vitamins. Vitamin B-6 is found naturally in many foods and is an uncommon deficiency in people with regular diets. It is involved in regulating brain chemistry, immunity and metabolism. The Office of Dietary Supplements recommends a daily intake for adults aged 19 to 50 of 1.3 milligrams per day. For men over 51 and over, the recommendation is 1.7 milligrams, while for women over 51 the intake is 1.5 milligrams. A severe deficiency in vitamin B-6 is linked to electroencephalographic abnormalities -- neuron activity in the brain associated with motor tics in Tourette's syndrome and obsessive-compulsive disorder. Vitamin B-6 deficiency happens most commonly in tandem with vitamin B-12 deficiency. Vitamin B-12 is broken down in the stomach by intrinsic factor, a protein that aids in digestion of the vitamin. People who have pernicious anemia often experience vitamin B-12 deficiency: Pernicious anemia prevents the production of intrinsic factor, so they can't absorb vitamin B-12. The Office of Dietary Supplements recommends 2.4 micrograms of vitamin B-12 for adults each day. Lesser intake can result in nerve damage, which can lead to motor tics and less control over the hands and feet. Vitamin E is an important fat-soluble vitamin that occurs naturally in some foods and is added as a supplement to others. The daily recommended intake of vitamin E is 15 milligrams per day for people over the age of 14. Vitamin E deficiency is rare in healthy people, but those who have difficulty digesting fat may experience a deficiency. This can be expressed as uncoordinated muscle movement or muscle weakness or spasm. Thiamine, also known as vitamin B-1, plays an important role in metabolism and the regulation of muscle contraction and nerve signaling. The recommended daily intake for thiamin is 1 to 1.2 milligrams per day. Thiamine is found in a variety of foods, so these recommendations are easily met for most people eating a healthy diet. Severe thiamine deficiency -- seen most frequently in alcoholics -- can lead to weakness, fatigue and nerve damage.